KARNATAKA ASSEMBLY Speaker K R Ramesh Kumar on Monday asked the JD(S)-Congress coalition government to set up a special investigation team (SIT) to investigate an audio recording of a purported conversation in which a payment of Rs 50 crore as bribe to the Speaker to facilitate poaching of ruling MLAs is allegedly discussed. While Chief Minister H D Kumaraswamy agreed to an SIT probe, the BJP sought a probe by a judicial or a House committee instead. The audio clip is of a purported conversation between JD(S) MLA Naganagouda Kandakur’s son Sharanagouda Kandakur and a man identified by Kumaraswamy as Shivanagouda Nayak, BJP MLA from Devadurga. The BJP allegedly sought to lure the MLA by offering Rs 25 crore and a minister’s post. In the audio clip, the man identified as Nayak is heard assuring Sharangouda Kandakur that all his concerns would be taken care of. “All arrangements have been made for (Speaker) Ramesh Kumar to accept the resignations when the number of MLAs touches 15. The money has been fed to him… Rs 50 crore… the Speaker,’’ says the man identified as Nayak. He is also heard saying that arrangements have been made at the party’s highest level to deal with judges. Saying that the recording casts aspersions on his character, the Speaker said the SIT probe should be conducted in 15 days. 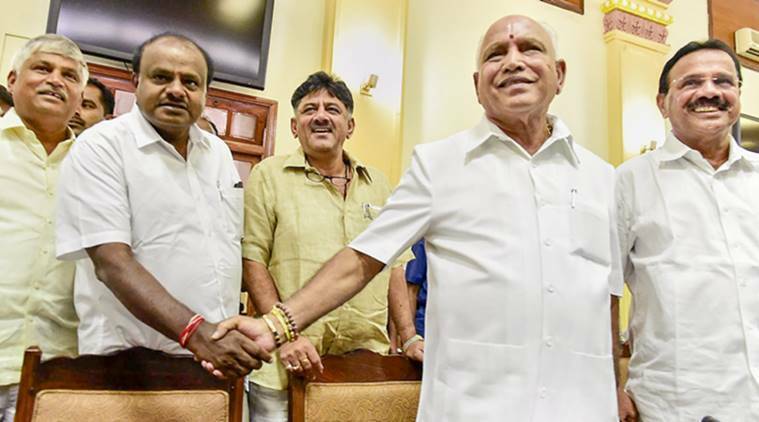 Accusing the BJP of trying to poach his party MLA, Kumaraswamy had released this audio clip, along with another of a purported conversation between Sharanagouda Kandakur, BJP state chief B S Yeddyurappa, and the man identified as Nayak, last week. Yeddyurappa on Sunday admitted that he met Sharanagouda Kandakur on the night of February 7 at a circuit house in Devadurga. He also admitted that it was his voice in one of the recordings. After releasing the audio clips, the CM wrote to the Speaker, informing him about the purported conversation. “The Leader of the Opposition and Devadurga MLA Shivanagouda Nayak have spoken disrespectfully about your position and honour,’’ CM said in his letter to the Speaker. “Hassan MLA Preetham Gowda (of BJP) was also present. The words I have heard have hurt me deeply. I could not have imagined that a member of the Legislature would speak in such a manner about the Speaker. I have sent the recording to you. As the Leader of the House, I would like you to consider the recordings and take suitable action as per law,’’ he said. On Monday, when the House convened, the Speaker expressed sadness over the alleged mention of his name. The audio recording reveals an “intent to induce and the amount is Rs 50 crore”, he said. “Identification and authentication of the person who is speaking is not done. I cannot continue because the allegation made is against me alone,” he said. The Speaker said he was confident that it was not Yeddyurappa who made the statement about him but an MLA who has to be identified. Congress legislator Krishna Byregowda argued that the matter involved a breach of privilege and contempt of the entire House. BJP’s J C Madhuswamy said the House should not take the matter too seriously as the events occurred outside the House.